Coca-Cola and Danone have not yet decided on biobased plastics for their bottles (PET or PEF), but DuPont announces another competitor: PTF. Last month, it published its plans to construct a 60 ton/year ‘demonstration plant’ (rather a pilot plant, at this size) in Decatur, Illinois, USA. Not for PTF though, just for its component FDME. Can PTF really become a competitor? The DuPont press release announces its plans with the usual bravado. DuPont Industrial Biosciences and its partner Archer Daniels Midland (ADM) announce a ‘game-changing’ technological breakthrough. A breakthrough with ‘the potential to expand the materials landscape in the 21st century with exciting and truly novel, high-performance renewable materials.’ With applications in packaging, textiles, engineering plastics and many other industries. On a closer look, they communicate the development of a method of producing furan dicarboxylic methyl ester (FDME) from fructose. FDME could be polymerised with propanediol (PDO) to the fully biobased and recyclable new plastic polytrimethylene furandicarboxylate (PTF). A plastic of which the partners claim that, ‘when used to make bottles and other beverage packages, (it) substantially improves gas-barrier properties compared to other polyesters.’ Incidentally, DuPont happens to be the most important producer of biobased PDO too. But did not we hear this story about the ‘substantially improved gas-barrier properties’ already? Yes, when Avantium started propagating its polyethylene furanoate (PEF) as a better alternative to PET (polyethylene terephthalate). 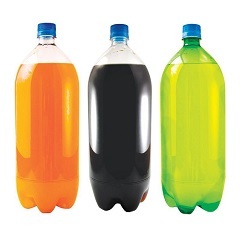 PET, PEF and PTF are closely related high-quality polyesters that can all be used for the production of beverage bottles. The difference being that PET is well-established, yearly produced in tens of millions of tons, PEF is the runner-up that claims to be better, and PTF is the new kid on the block with no history at all. A few years ago, Coca-Cola and Danone announced their intention to produce bottles from 100% biobased plastics (in contrast to the so-called plant bottle that is just 20 to 30% biobased, dependent on the calculation method). They invited three companies to compete: Virent and Gevo, companies that intend to produce 100% biobased PET, and Avantium, that proposes PEF as an equally 100% biobased alternative. This competition in biobased plastics is running from 2011 onwards, and the decision might well be taken this year. So far, PTF has not been included in the game. Could DuPont produce a trump card that would make it part of the game after all? The global market for softdrink bottles is huge. Supermarket in Brno. But the proposed intermediate FDME might have a market of its own. Its parent molecule, FDCA (furan dicarboxylic acid) was the only heterocyclic molecule included in the famous DoE list of promising biobased chemicals of the future. But then, Avantium might be a competitor. 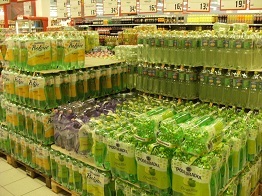 It intends to market FDCA apart from its possible deal with Coca-Cola. Last month, it signed an agreement with Mitsui; the latter will purchase a sizeable volume of FDCA from Avantium’s planned commercial facility. Both companies intend to launch PEF and other FDCA-based applications in Japan, well in time for the Tokyo Olympics in 2020. And other companies have announced that they will produce and market FDCA as well: Dutch Corbion and just yesterday, Swiss Ava Biochem. Corbion will produce FDCA through an enzymatic process, Avantium and AVA employ modern chemistry, all starting from sugar as the feedstock. So the market is open for real competition. In its review of 2015 biobased chemicals, British consultant NNFCC suggested that FDCA might make a breakthrough in 2016. So after all, DuPont’s PTF might be too late in the field of biobased plastics. Despite all its slogans, DuPont did not make clear any advantage of PTF over PEF. With the present information it looks like a ‘me too’, and an attempt not to miss the promising future of biobased plastics. By now, the most pressing questions concerning PEF have been answered. It can be processed on the same machines as PET. It can’t be mixed with PET in recycling, but PET and PEF can easily be separated in recycling facilities through infrared light. And PEF can be recycled to fibres, just like PET. All these issues have not been resolved for PTF. So after all, DuPont’s bravado might just a bit too much. ‘This molecule (FDME) is a game-changing platform technology. It will enable cost-efficient production of a variety of 100 percent renewable, high-performance chemicals and polymers with applications across a broad range of industries,’ said Simon Herriot, global business director for biomaterials at DuPont. No doubt, but it might not be timely any more. In short, the landscape is changing. We might soon see some major changes in the field of biobased plastics. We will follow developments closely. And keep you posted. Didn’t know about the development, fascinating news!